Austin officials initially priced the Shoal Creek storm drain improvement project at about $1 million. But when the final bill was paid, the project actually cost Austin taxpayers about $7 million. The renovations to City Hall and the City Council Chambers to make room for the larger, 11-member council that took office in 2015 was originally priced at $1.4 million. The costs soared to $6.4 million. Those two projects were just a few in an audit of Austin’s Public Works Department released last week that found almost one-third — 29 percent — of the 48 projects it reviewed had costs balloon at least 50 percent higher than the staff’s original estimates. As promised here's what happened on the big three items yesterday. Conduct a public hearing to receive recommendations from the stakeholders group established by City Council to make recommendations concerning non-criminal alternatives to City Code Chapter 9-3, relating to a juvenile curfew, and to consider an ordinance that continues, readopts, or amends City Code Chapter 9-3, relating to a juvenile curfew. As we said in our testimony, we were shocked when we learned that Austin had this policy on the books. The "juvenile curfew" was a legacy of 1990's era "tough on crime" hysteria. The policy allowed police to arrest or fine minors who weren't doing anything wrong except being out on the street at a time of day of which the government didn't approve. Obviously, we have plenty [Note: actually waaay too many] of criminal statues already on the books to deal with any actual criminal activity. Council correctly repealed this policy and we applaud them for so doing. Approve a resolution directing the City Manager to explore funding options such as public improvement districts, tax increment financing, public-private partnerships, and increases in hotel occupancy taxes to fund improvements to downtown Austin, to address homelessness in downtown Austin, to support the local music industry, and to fund park, civic, and historic facilities and districts including expansion of the Convention Center. This is Mayor Adler's so-called "downtown puzzle" we first discussed last month. As introduced, it was a needlessly complicated real estate scheme allegedly designed to 'solve' a number of alleged 'problems' related to downtown (including expanding the convention center). We have a number of issues with the proposal, but as we stated in our testimony our biggest concerns are with the nature of the tax increases and complicated corporate welfare mechanisms being used to finance large components. The good news is that they didn't take any action, but instead returned the question to staff. To be honest, we left City Hall to watch the football game for several hours during dias discussion. [Note: Mayor Adler in response to a request from this author, put the game on in a side room at City Hall. We didn't see it and thus watched it off-site. But we want to mention that Mayor Adler kept his word and we thank him for doing so.] The Austin Monitor has a good roundup of everything we missed here. That being said, what happened last night was at least a step in the right direction as far as process. Instead of trying to force something through that clearly wasn't ready for prime time (a la last year's transportation bond), returning the issue to staff at least gives them a chance to come back with a much more workable proposal. In what's becoming an oddly recurring experience, we once again found ourselves in total agreement with several points Kathie Tovo made related to this subject. Approve a resolution directing the City Manager to convene a stakeholder process to gain feedback on elements of a paid sick days policy for private employers in Austin. This is the "paid sick leave" mandate we discussed three weeks ago. Obviously, it passed. The good news is that this is just the beginning of the process, so there are still opportunities to stop it. But there needs to be a backlash, we can't do this one alone. 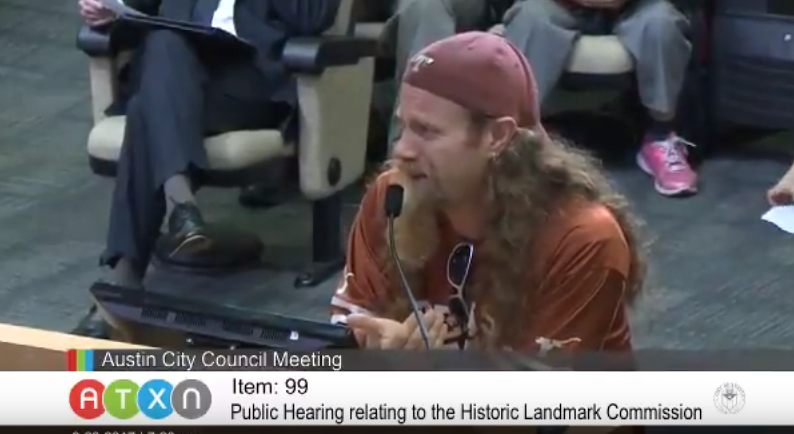 Finally, while we forgot to mention this during our testimony, it's highly dubious whether or not the City of Austin has this authority in the first place under state law; we need to get an attorney general opinion on this topic. 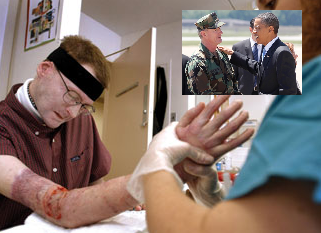 Bottom Line: One good thing got done, and neither of the bad things is a done deal at this point. And afterward build your house." Approve a resolution ratifying the collective bargaining agreement between the City and the Austin Firefighters Association relating to wages, hours, and terms and conditions of employment for Austin firefighters. This would pour more money into the status quo with the firefighters union; keep in mind, this is the same firefighters union that is getting the city sued due to illegal subsidies in the current contract. This is a bad idea for the same reason that subsidized housing is always a bad idea: Subsidized housing always and forever raises the cost of housing for eveyone who doesn't get a subsidized unit and that's the vast majority of people. Authorize negotiation and execution of an 84-month lease for approximately 59,494 square feet of office space for the Development Services Department and Austin Energy, at 5202 East Ben White Boulevard, in Austin, Travis County, Texas, from 5204 BEN WHITE 2017, LP, A TEXAS LIMITED PARTNERSHIP, in an amount not to exceed $10,936,187.34 (District 3). Remember, 5 weeks ago, when "development services" got $122 million for a new building?!? Well, now they're getting a seven year extension of the status quo. Either the city didn't level with us about the building they approved last month, or our longstanding complaint about the city's inability to complete projects in a remotely timely manner applies; most likely both, but neither is good. Conduct a public hearing and consider an ordinance amending City Code Section 25-2-355 relating to voting requirements applicable to zoning recommendations by the Historic Landmark Commission. We discussed this issue in relation to a bill the legislature considered in April. This item would weaken the existing protections for property owners, but wouldn't gut them entirely. Still, not good. Bottom Line: Honestly, we need a hug. I will be paying every city of Houston invoice they submit to us within approximately 10 days. Now that said, I did see the mayor’s letter where he’s asking for certain payments by the state of Texas to the city which are unprecedented, this never happened before in the state of Texas, and it raises a concern that the mayor seems to be using this as hostage to raise taxes, when in reality, the city of Houston is sitting on hundreds of millions of taxpayer dollars that he’s not tapping into. Abbott is absolutely correct on this. "Tax Increment Financing" and "Tax Increment Reinvestment Zones" are an abominable public policy practice that should be abolished in their entirety. In the meantime, those funds should absolutely be tapped before asking overstretched taxpayers to pony up more. 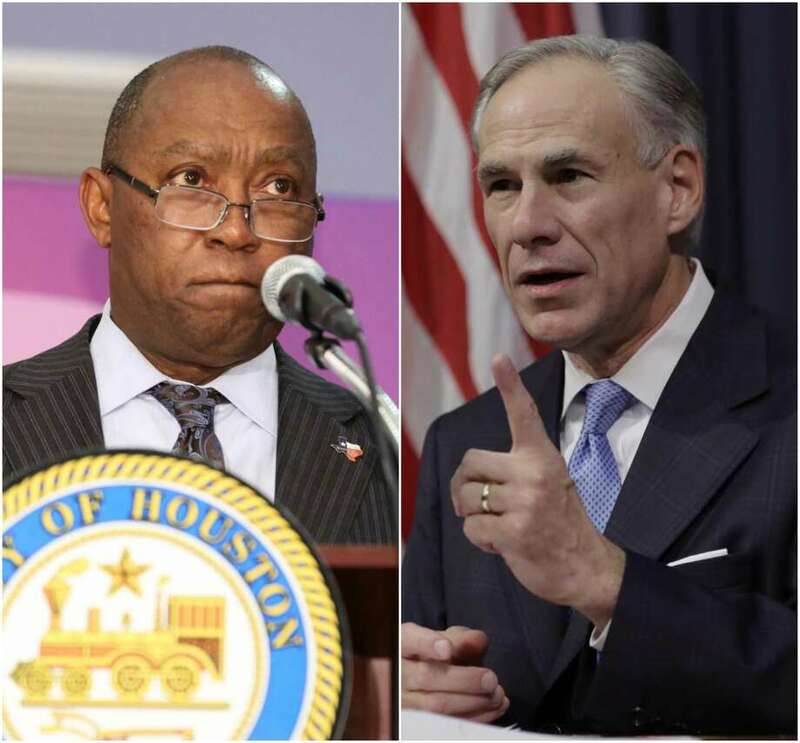 Bottom Line: It's not a secret that this website has its issues with Governor Abbott, but he's spot on here. Preliminary enrollment numbers show more than a 1,600-student drop in the Austin district, which would be the biggest loss of students in a single year since the district’s attendance peaked in 2012. There is time for a rebound. Unofficial student enrollment numbers taken from the third week of school show enrollment at 81,427, down 1,640 students from last year. But enrollment from the same day last year shows a smaller decline of 1,176 students. The 2017-18 school year losses would mark the fifth consecutive drop and the district’s lowest point in more than a decade. Two years ago, Austin lost its position among the top five largest districts in the state. [W]e’re now in year three of the Paxton prosecution, and those attorneys have yet to introduce or even hint at the existence of any evidence at all that Paxton ever misled anybody. We’ve got a fraud case, in other words, with no fraud. Ostensibly, the case is about a group of investors who put money into a startup that flopped, and then got mad at Paxton when they learned he hadn’t put any money into the company he had recommended. But those investors admitted to law enforcement, in records I’ve reported on, that they had just assumed Paxton was investing in the company. The fraud, such as it were, is that Paxton failed to disabuse them of a mistaken assumption that they never discussed with him by, I don’t know, using the Force or something. For that, the state is trying to imprison him for 99 years, the Securities and Exchange Commission brought a civil action over the same matter, and a federal judge tossed it at the first opportunity, finding that the SEC’s idea of law-breaking was flat wrong even if all their factual allegations could be proven correct. This is the machine that grabbed ahold of Paxton. 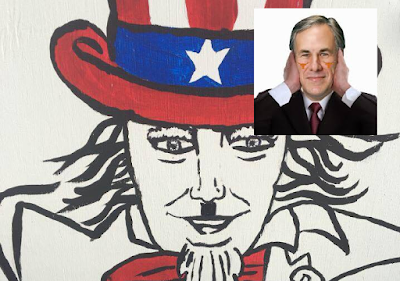 Would Joe Straus really switch parties and run against Abbott?!? About an hour ago, we sat down to write a blog post arguing why this would never happen. But the more we think about it, the less sure we become. 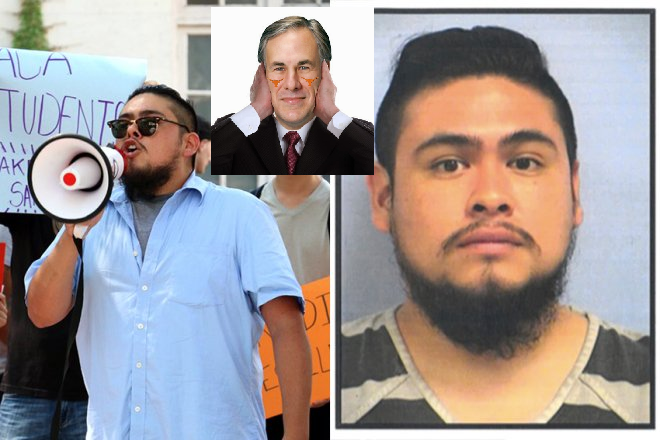 Let's put it this way: Probably not (and certainly not if he has any sense)...but Joe Straus is so dadgum arrogant that we can't put it past him. With all due respect to Michael Quinn Sullivan, he wasn't in that room on Saturday. This author was. And we think Straus is running for another term as speaker. Start with the fact that that's what Straus said he was doing on Saturday. Furthermore, in response to our own question on Saturday, Straus went to extended lengths to remind this author of the fact that he won house district 121 by 32 points in 2016. As it relates to the question about running for Governor, while it's absolutely true that Straus didn't shut the door, as someone who was in the room we must point out that that question was asked in the context of a) an eventual open seat whenever Abbott retires and b) running as a Republican. It doesn't take a genius to see how Straus comes back. It's the same playbook they've used the past few cycles. Your most toxic incumbents [eg. Byron Cook, Dan Flynn, and Dan Huberty] retire. You have the local chamber recruit some faceless hack with low self-esteem to run in the open seat [eg. John Wray, Ernest Bailes]. Then you combine the fact that the new guy doesn't have a record with a significant spending advantage, and you hold on to enough open seats that the basic outlines of your coalition remain intact. Like we said, that's what they've done the past few cycles. We're not convinced the caucus is done with Straus. We'd love that to be the case, but we've gotten burned predicting that in the past. Arguing "this time is different" remains perilous. If you're Joe Straus, and you're smart, your goal is to stop major conservative priories from being enacted. If that's your goal, then you've actually been pretty successful the last few years. Why mess with what, from your perspective, seems to be working?!? Then there's the fact that running against Abbott would be a suicide mission for Straus. Joe Straus might face an uncertain future with the house republican caucus, but no Democrat is getting elected statewide anytime soon. Joe Straus has to know this...right?!? If Straus switches parties to run against Abbott, such a move would instantly turn the race into a national story. And if Straus turns this race into a major national story, he turns the fact that the Texas house has been run by liberals for the past decade into a major national story. And if Straus turns the leadership style of the Texas house into a major national story, when Straus inevitably loses the jig will finally be up. So that's why we think Straus won't switch parties. That's certainly why he shouldn't if he has any sense. But, that being said, we can't eliminate the possibility that Joe Straus is so arrogant that he gets seduced into running. Here's how the narrative would work: Blah, blah bathroom bill. Blah, blah economy. Never mind the fact that nothing of the sort happened in either Houston or North Carolina. 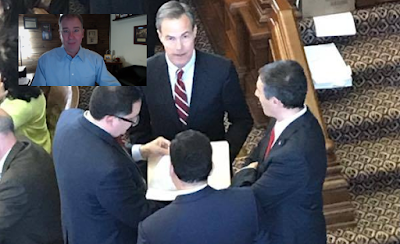 Of course, if Joe Straus were to attempt to portray himself as some sort of savior for the state's economy, the next point to raise is obvious: Joe Straus is the primary reason why the Texas Legislature failed to address property taxes last session. During both the regular session and the special session, the Senate passed bills that were tangible steps in the right direction, and both times the house refused to negotiate in good faith before the house watered them down into meaninglessness. Good luck running a campaign based upon "the economy" with your pro-high property taxes record. Bottom Line: If he has any sense, Straus isn't running; but if he's arrogant enough to try then, to paraphrase Dirty Harry, he's welcome to make our day. 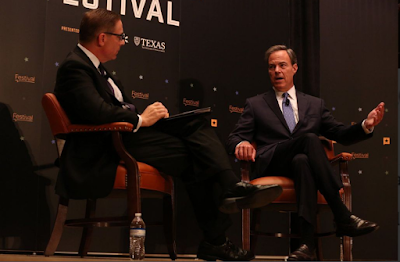 That was Joe Straus' response when we asked him his reaction to the no-confidence resolutions over 50 Republican county party executive committees have passed related to his leadership when we asked him this morning at TribFest. We weren't taking notes, so we can't promise that the above quote is a perfect transcription of his exact words, but it's an accurate representation of its spirit. He also made a bunch of excuses related to passage of the resolution in his home county that were previously debunked. 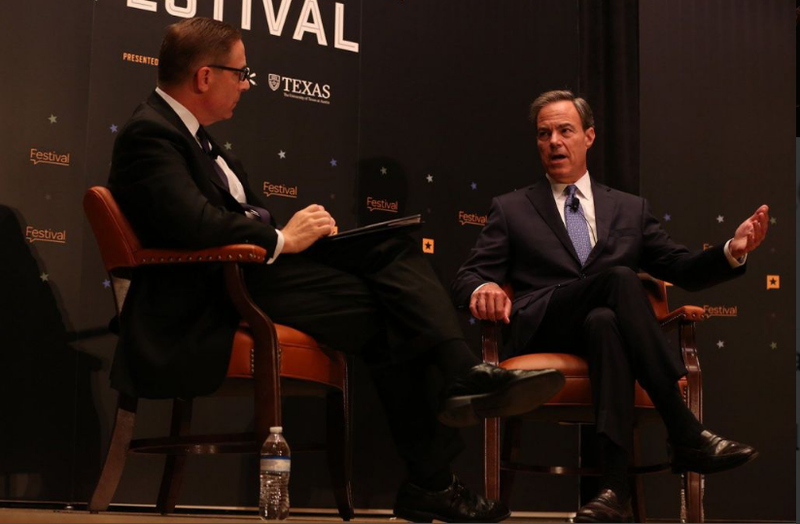 In response to a separate audience question, Straus claimed the current leadership of the Texas House doesn't play fast and loose with parliamentary procedure. Obviously, that was a bald faced lie. See here and here for examples. Basically, Straus was as arrogant and smug as we've ever seen him. Straus also made several references to the wide margin of victory he achieved in his last election in reference to how the voters in his district feel about the Republican party platform [Note: Spending seven million dollars in that campaign probably didn't hurt either]. That might be true, as far as his personal district goes. But we suspect that's going to be a much more difficult sell in the districts of his committee chairs. Finally, in response to a question from Texas Right to Life, Straus pretended to be unfamiliar with the Texas Advance Directives Act. He then attempted to obfuscate by misrepresenting the DNR bill that was passed during the recently concluded special session as the TADA. Once again, this was another bald faced lie. Bottom Line: Joe Straus doesn't care about the RPT platform, he said so himself this morning. On Wednesday, we reported on the communist inspired vandalism against a widely respected right of center student organization that has been active in Texas politics for four decades. 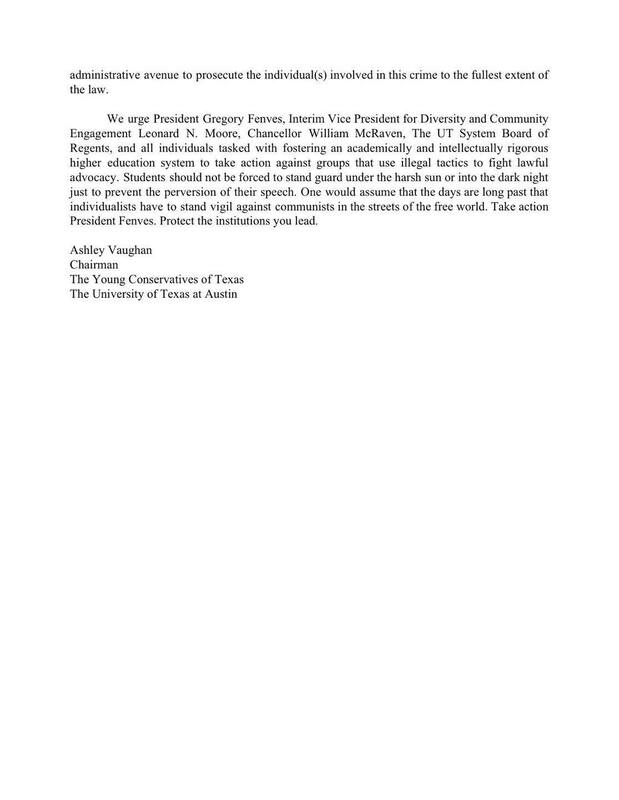 President Greg Fenves needs to take all necessary steps to ensure that the free speech rights of all students on campus are protected from violent political intimidation. Note: Considering that this is the same Greg Fenves who hasn't done a damn thing about two on campus murders in 13 months, consider us skeptical that this step will occur. If President Greg Fenves fails to fulfill his responsibility to maintain a campus free from violent political intimidation, then the Board of Regents needs to fire him and replace him with someone who will. 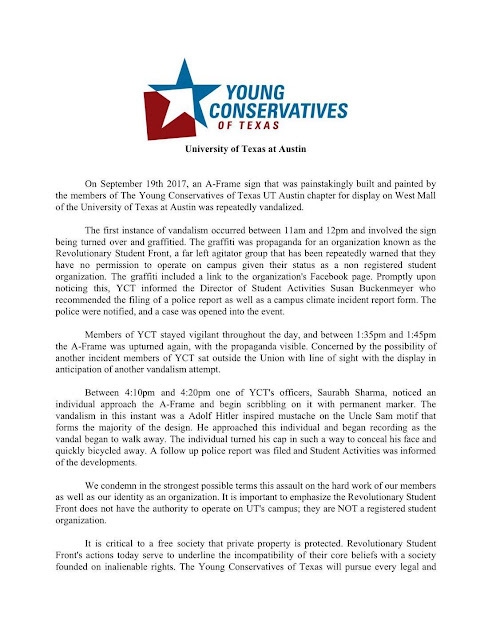 If President Greg Fenves fails to fulfill his responsibility to maintain a campus free from violent political intimidation, and the Board of Regents fails to fire him, then the allegedly conservative Governor who has appointed a majority of the currently seated Regents (and who, just this past Monday, had his handpicked choice elected to chair the Board) needs to explain to the public why he is allowing a culture of violent political intimidation to fester on the state's flagship public university campus. Note: Keep in mind, this is the Governor who once bragged about giving "marching orders" to his university Regent appointments. 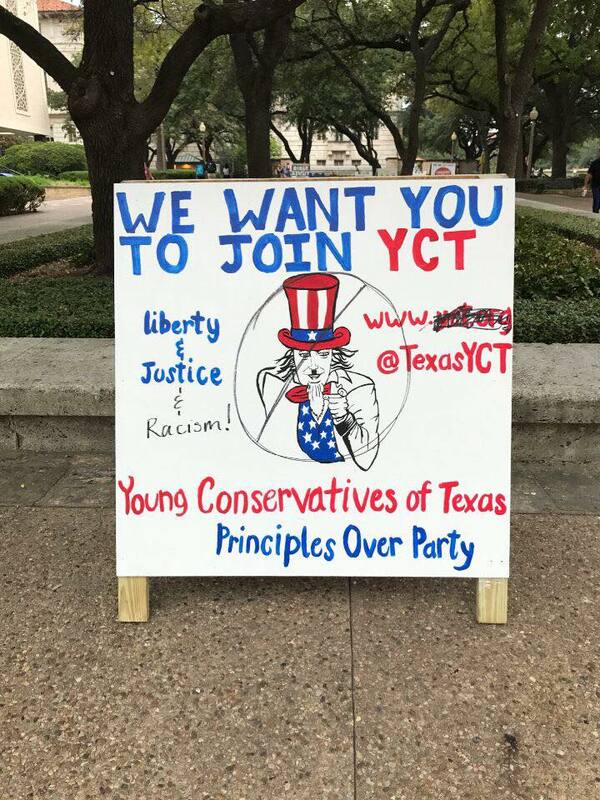 Bottom Line: The festering culture of violent political intimidation on Texas' flagship university campus cannot continue. But he who is impulsive exalts folly." By now, we assume you've heard about the unflattering pictures that have been circulating around the internet for the past week. If you haven't, you're welcome to search for them yourself. No link here. That's fine; until we are given a good reason to do otherwise, we take Council Member Flannigan at his word. He sent the picture to someone who didn't want to receive it. He sent the picture to someone underage. He sent the picture on city time. As far as we can tell, none of those conditions have been met. In the event new information emerges, we reserve the right to change that view. But that seems unlikely at this time. Now, look, we have our issues with Jimmy Flannigan. Jimmy Flannigan is a big fan of corporate welfare. Jimmy Flannigan voted for the disgraceful MERCK deal the city passed in April. Just last week, Jimmy Flannigan doubled down on support for the Domain subsidies. We can only imagine what kind of godawful 'incentive' package [note: pun not intended] Jimmy Flannigan is going to push to attempt to lure Amazon. But, unless and until one of the three conditions we listed above is violated, this website remains as uninterested in Council member Flannigan's personal life as we've always been. Finally, we want to address the chatter we've been hearing about a recall election: This is one of the dumbest ideas we've heard in a long time. Unless or until new information emerges, the voters won't care and such an effort would be a guaranteed loss. This website will not participate in a fools errand over a single tacky photograph. Bottom Line: This whole 'controversy' is stupid and we hope this is the last time we have to address it. 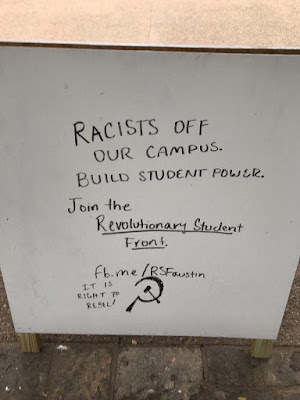 Remember, back in June, when we observed that violent communists were recruiting at the University of Texas' flagship campus and that it would lead to some very bad incidents this fall?!? How the sign was discovered. And all this, literally, on the day after Abbott's hand picked candidate is elected to chair the Board of Regents. Obviously, President Fenves and (to a lesser degree) Chancellor McRaven are the ones who should take the lead rooting out this nonsense. If history is any guide, they won't. Assuming Fenves and McRaven refuse to do their jobs, the Board of Regents (which Abbott controls) should fire BOTH. Bottom Line: Greg Abbott owns this. It's his Board of Regents and his hand picked board chair. 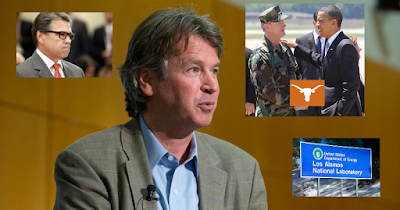 If Fenves, McRaven, and the Board refuse to act that's where the blame lies. Tucker was nominated by Chairman Paul Foster, and the motion was seconded by Vice Chairman Steve Hicks. Prior to her appointment as regent, Tucker, a native of Laredo and resident of Dallas, served as the nation’s top higher education official as under secretary of the U.S. Department of Education under President George W. Bush. There, she oversaw all policies, programs, and activities related to postsecondary education, vocational and adult education, and federal student aid. Tucker also served as the CEO and president of the Hispanic Scholarship Fund, where she pursued an aggressive goal to double the rate of Hispanics earning college degrees. Prior to her work in the nonprofit sector, she was a long-time executive at AT&T. Tucker currently serves as chairman of the Regents’ academic affairs committee, in addition to serving on the health affairs, finance and planning, and audit, compliance and risk management committees. Tucker earned a bachelor’s degree in journalism and a master’s degree in business administration from UT Austin. Tucker has been named as an Outstanding Young Texas Ex and a Distinguished Alumna at UT Austin and among many honors has received honorary doctorates from the University of Notre Dame, Boston College, and the University of Maryland University College. “I am honored and humbled by this great privilege, and I am grateful to my colleagues for entrusting me with this responsibility. Having the opportunity to work with extraordinary board members, system administration leaders and visionary university presidents to ensure that UT students and patients have access to the best possible outcomes is and will always be my top priority,” said Chairman Tucker, following her appointment. Although by outward appearances the regents select their own leader, in actual practice the governor’s office signals the choice and the regents follow suit. In other words, the UT Board now not only contains a majority of Abbott appointees, but it's now led by Abbott's hand picked chairwoman. Second on campus murder in 13 months. Following the afore mentioned second murder in 13 months, the Board of Regents has declined to have a public discussion of on-campus security in not one, not two, but three separate Board meetings. UTIMCO's refusal to deposit their gold at the state bullion depository. 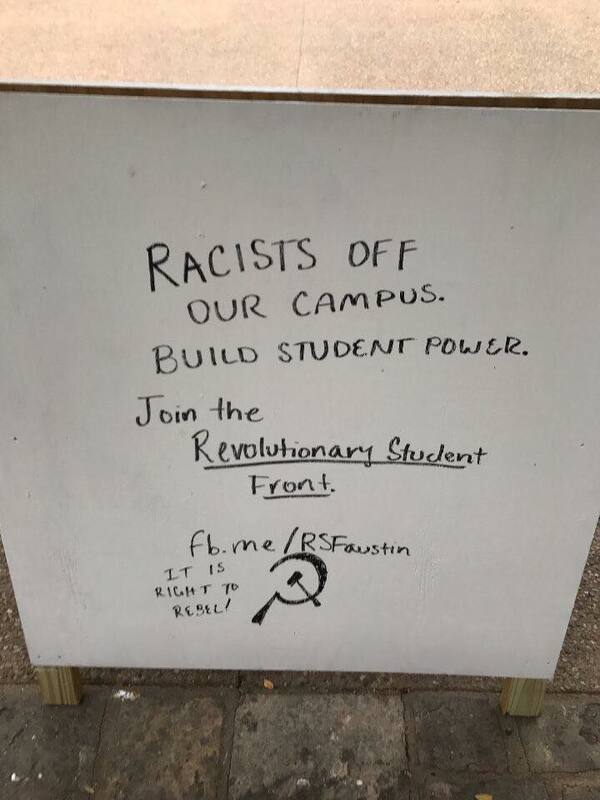 Violent communists recruiting on campus. Creation of an arbitrary "sexual assault" policy to please a big donor, which predictably leads to them getting sued. The early seeds of another tuition hike. Defying Abbott over statue removal. An absurd proposal to supervise the nation's nuclear weapons arsenal. The University chancellor grandstanding over immigration in response to a sensible change in federal policy. 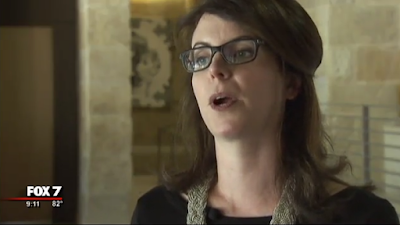 A separate Abbott-appointed regent expanding so-called "social work." A left wing student assaulting a student reporter for the Daily Texan. 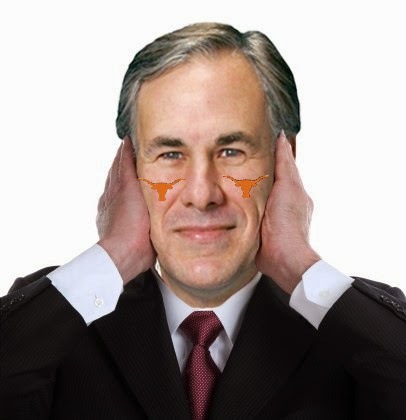 Bottom Line: Anytime you wonder how the University of Texas consistently gets away with terrible behavior, and what can be done about it, remember that the Governor's office controls the Board of Regents. But a false witness will utter lies." We caught the tail end of a public Secretary of State hearing this morning that illustrates both bureaucratic mendacity and the ability of an engaged citizenry to get the bureaucracy in question to back down. This past spring, election integrity activist (and former #atxcouncil candidate) Laura Pressley joined with a voting machine vendor to ask the Texas Secretary of State's office (which oversees elections) to permit county election officials to purchase voting machines that would leave create a verifiable paper trail. When the proposed rule was announced in July, it included a provision that would have significantly weakened provisions requiring 'audit logs' for electronic voting machines. This would have had the effect of gutting the effort to create a verifiable paper trail for future elections. 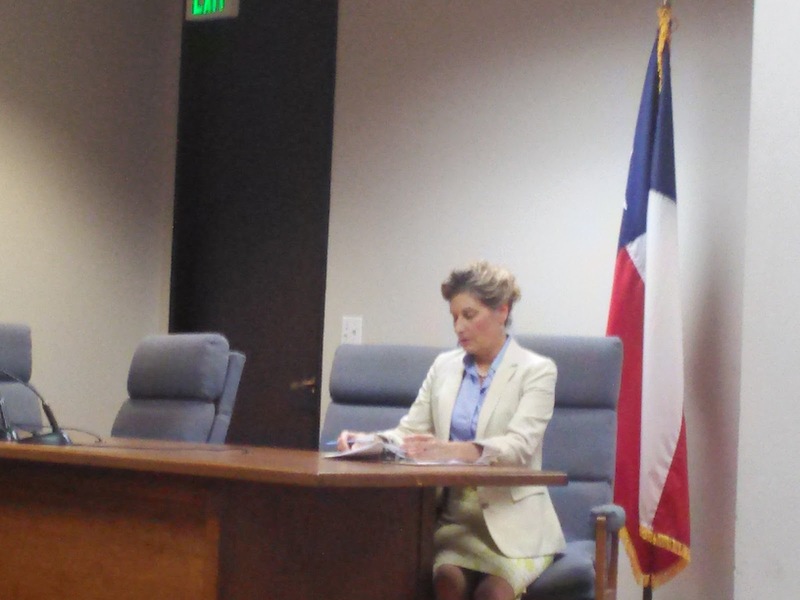 Fortunately, Pressley caught the proposed change while reviewing the Texas register (where proposed regulatory changes are first announced to the public). The bureaucrats in the Secretary of State's office claimed that the petition they received from a different group of bureaucrats elsewhere in the Sec'y of States office was requesting the rule change under consideration; both Pressley and the vendor disputed that account and stated that they only requested the paper trail provision. At best, it appears that one group of bureaucrats in the Secretary of State's office isn't communicating with a second group of bureaucrats in the Secretary of State's office. Fortunately, the Secretary of State's office backed down and agreed to drop the 'audit log' provision. We haven't been in particularly close contact with Pressley (outside of seeing her at occasional social functions) for about a year. Thus we walked into today's hearing cold, with no knowledge of the specific issue that led to today's hearing. Furthermore, we were 40 minutes late today. Coming into today's hearing cold led us to observe body language and vocal tone much more closely than we would normally. We were struck by the amount of passive-aggressive lawyer talk used by the bureaucrats, while they attempted to shift blame to other folks in the Secretary of State's office. Pressley, by contrast, had a calm and reasonable demeanor throughout. Bottom Line: The good guys won one!!! On the other hand, Congress has the authority to permanently shut down this farce...yet Texas' congressional delegation continues to do NOTHING. a) They won't be back in 2020 attempting to pick off a seat or two during a presidential year?!? 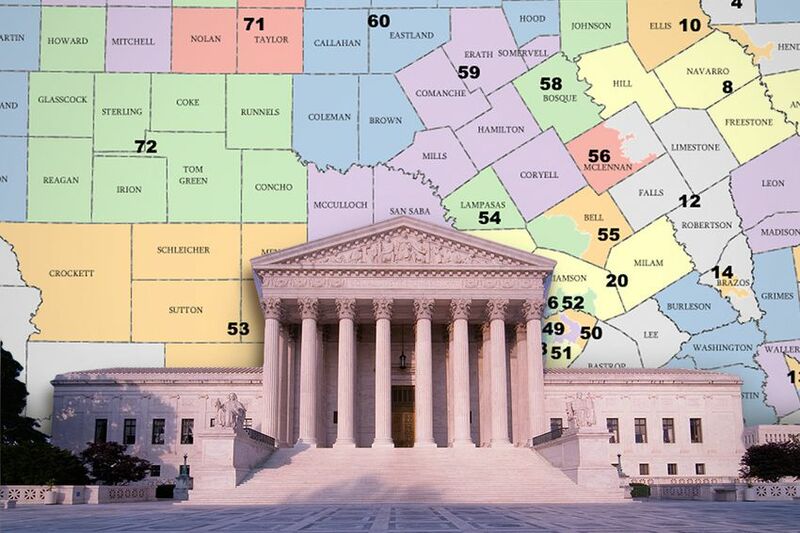 b) Another round of lawsuits won't follow the next round of redistricting?!? Bottom Line: Yesterday's decision was better than the immediate alternative, but as long as the current vague Federal statutes remain on the books this ongoing fiasco will continue. 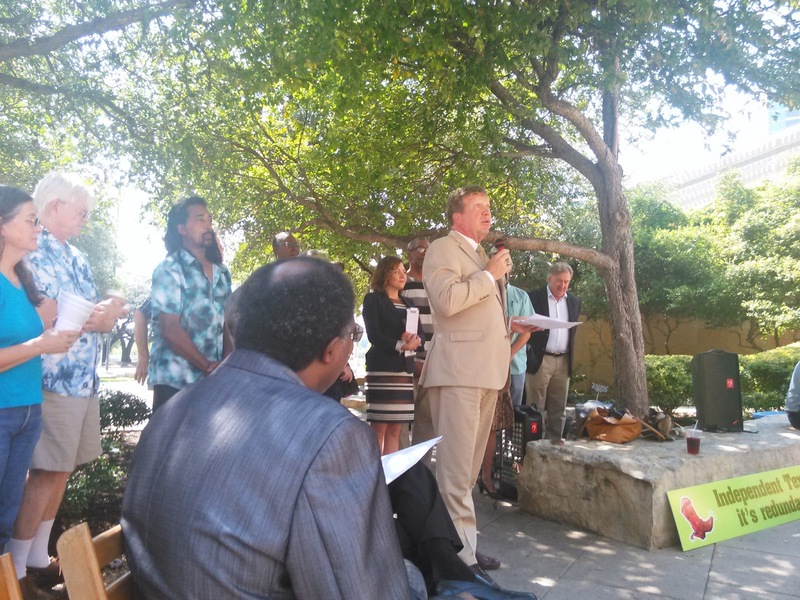 #atxcouncil: Late Breaking opportunity to curtail corporate welfare in budget?!? He also will deny us." Austin’s 2018 budget discussions are crawling to a close this week, and City Council members are looking for more cash. Council Member Leslie Pool began the week’s talks Monday with a request for the city to revisit its economic development payments to the Domain — revitalizing a debate that’s been ongoing for at least a decade. It wasn’t clear whether the suggestion had any support to move forward, and the council didn’t immediately return to it after an executive session to discuss legal matters behind closed doors. The council is expected to adopt the budget sometime this week. The fiscal year begins Oct. 1. Austin in 2003 approved a $37 million tax break over 20 years for the Domain in exchange for the development creating jobs and affordable housing. Some buyers’ remorse settled in after that, and a push to revoke the Domain’s incentive package became a ballot proposal in 2008, but voters rejected it. The city’s agreement with the Domain, which is in Pool’s North Austin District 7, includes a stipulation that any payments are subject to agreement from future councils. But Mayor Steve Adler and Council Member Jimmy Flannigan pushed back strongly against the city backing out of its end of the economic incentive agreement, saying it would be a terrible precedent to set. Austin needs to live up to its deals, they said. Some council members have expressed frustration with the budget overall and want more funding for health and social programs. 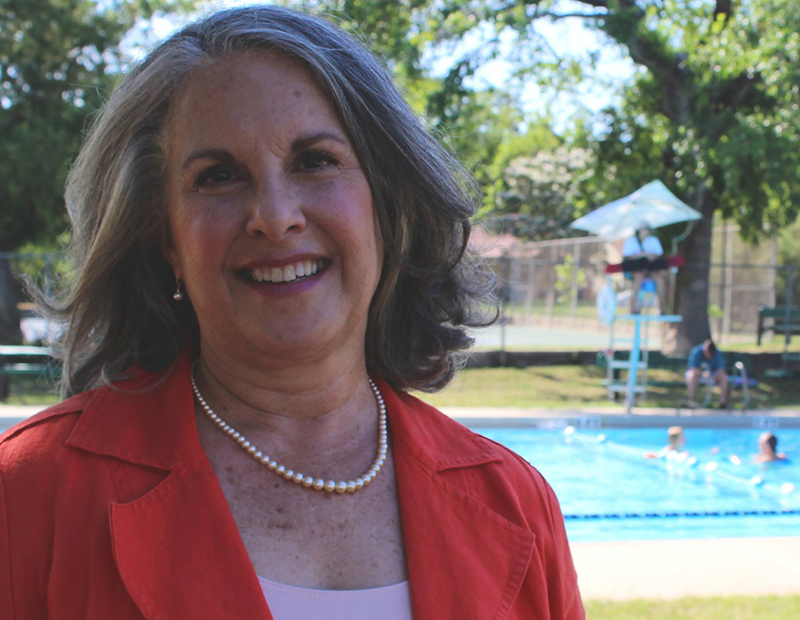 While the Statesman article says Pool is a longstanding opponent of corporate welfare, this is the first time we remember hearing her speak about it. We will point out she voted for the Merck deal back in April. Still, welcome to the fight!!! This actually builds on a recent experience of our own. Last week, we attended an event where we were able to come to an agreement with several people with different views from our own to cut corporate welfare in order to create room for both tax relief and social services. Thus, this might be an outline for a "grand bargain" on the city budget. Broadening the tax base allows you to lower the tax rate. Flannigan's argument is cute. The opt out clause was part of the original deal to which the developer agreed. Thus the city wouldn't be backing out of anything but merely executing authority it already has. Speaking of Flannigan, this is the biggest contrast with his predecessor during his time on the council to date. If Flannigan really wants to make this a hill on which he's willing to die, we are absolutely willing to make this a campaign issue in 2020. Remember, District 6 residents are the one's paying the higher property tax rates that are the natural results of this sort of carving up of the tax base. Speaking of which...have we mentioned that broadening the tax base allows you to lower the tax rate?!? Broad base, low rates. Broad base, low rates. Broad base, low rates. Bottom Line: Anything that moves us away from special privileges for big players and towards clear and consistent rules for everyone is a trend we should encourage.